This beautiful two bedroom penthouse to rent is located in the heart of the sought-after St-Germain neighbourhood. 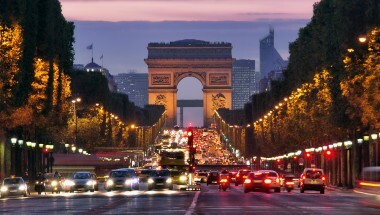 It is ideally situated within easy walking distance of many of the main sights of central Paris, including the Seine River, Musée D’Orsay, Ile St Louis, the Louvre, Luxembourg Garden, and all of St Germain-des-Prés. 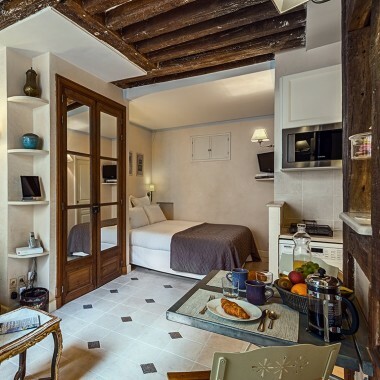 The building is a classic Parisian Hôtel Particulier, full of Old World charm. The apartment is on the fifth floor, and there is lift access to the fourth floor, and then one flight of stairs. The apartment’s most unique feature is its 100 square foot rooftop terrace. With a dining table seating four, this is the perfect place for enjoying a meal or glass of wine, while enjoying the incredible 180˚ views of the Eiffel Tower, Sacré Coeur, Musée d’Orsay and the city’s famous rooftops. The open living and dining room have hardwood floors, large windows, a decorative fireplace and are furnished with antiques. The kitchen is a Bulthaup design, with top-of-the-line appliances, including gas stove, oven, microwave, fridge/freezer and dishwasher. The master bedroom with queen bed is spacious and bright with Eiffel Tower views, and includes a modern en suite bathroom with a combination bathtub and shower and high-end fixtures. The cosy second bedroom includes a seating area that converts into a twin bed and has access to its own private, full bathroom with shower. 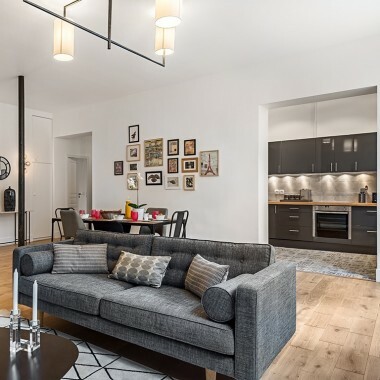 Both bedrooms provide a tranquil atmosphere for sleeping and relaxing, the flat being located on a quiet garden courtyard side of the building. Amenities include central heating, air conditioning, flat screen TV, DVD, computer, CD player, Wi-Fi internet, washing machine, dryer, hairdryer and ironing facilities. A beautiful two bedroom penthouse, with a roof terrace, located in the heart of the St-Germain neighbourhood. 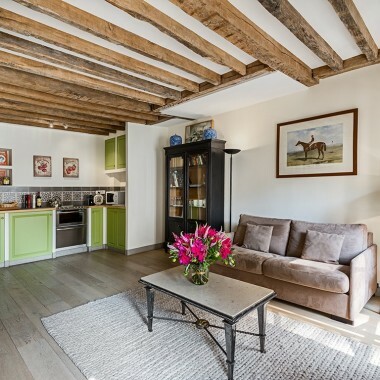 It is ideally situated within easy walking distance to many of the main sights of central Paris, including the Seine River, Musée D’Orsay, Ile St Louis, the Louvre, Luxembourg Garden, and all of St Germain-des-Prés.